Ryu Hyun-jin gives no walks, runs for 3 consecutive games. March. 11, 2019 08:10. by Heon-Jae Lee uni@donga.com. Los Angeles Dodgers pitcher Ryu Hyun-jin is being considered a leading candidate as a starting pitcher for the season’s opening game against the Arizona Diamondbacks, which will take place at the Dodger Stadium on March 29, as he continued to display top quality pitching in successive exhibition games. 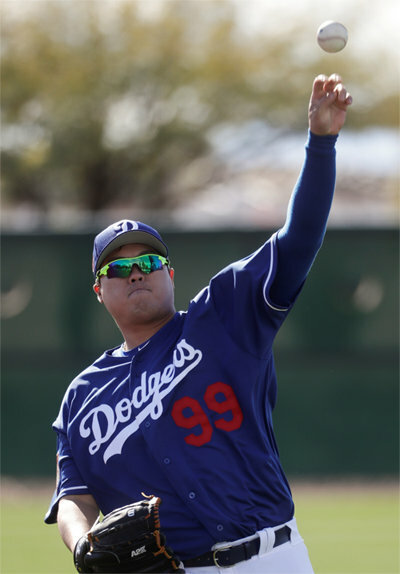 Ryu took the mound as the starting pitcher in an exhibition game against the Kansas City Royals, which took place on Saturday at the Camelback Ranch in Arizona where his team is running a spring training camp. Giving one hit and no run and posting three strikeouts during three innings in the game, the Korean pitcher has been continuing the streak of giving no-run in three-consecutive games after the games against the Los Angeles Angeles (no run during one inning) on February 25 and against the San Diego Padres (no run during two innings) on March 2. Ryu has not given even a single walk or run during the past six innings. Influential local media organizations including the Los Angeles Times and Dodger Blue reported that Ryu Hyun-jin could be the starter. If Ryu takes the mound as starter in the season opener, he will be the second Korea-born pitcher to start in a season opener in the Major League Baseball after Park Chan-ho. Park started twice in the opening game in 2001 for the Dodgers, and in 2002 for the Texas Rangers. Whether Ryu will start in the upcoming season opener or not depends on physical conditions of Clayton Kershaw and right-hander fastball pitcher Walker Buehler in his team. Dodgers manager Dave Roberts is still mulling Kershaw as his favorite for the opening game. Kershaw took the mound as starter in the season opener for eight consecutive years from 2011 to 2018. Roberts’ choice of Kershaw is only “under the condition that Kershaw is prepared.” Kershaw, who is struggling due to inflammation in his left shoulder in the ongoing spring training, pitched powerful balls on Saturday after a hiatus. However, he pitched on a flat ground rather than the mound, and has never pitched in a real game this year. Buehler conducted live pitching (pitching as if in a real game with a batter in the batter’s box) on the day for the first time this year. He has not suffered an injury but he is gradually stepping up his pace last year since he played throughout the entire season for the first time in his career. Regarding the possibility for Ryu’s pitching in the season opener, an American reporter asked Ryu about his experience as starting pitcher in opening games during his Korean pro-baseball league career. While playing seven seasons for the Hanwha Eagles in Korea, Ryu started in five opening games. The most recent game in which he started was the game against the Lotte Giants, which took place at the Sajik Baseball Stadium in Busan on April 7, 2012.